Her Royal Highness Princess Ashi Kesang Choden Wangchuk of the Kingdom of Bhutan visited the Institute on May 10th, 2016. She inspected the Institute’s activities for restoring and reproducing cultural assets with a view to helping the country conduct activities to preserve its cultural assets. After an opening address by Director General KAMEI, the Department of Research Support and Promotion gave a brief explanation. 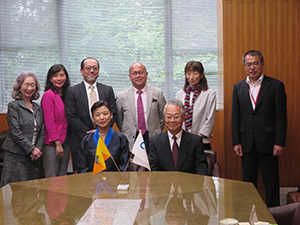 This was followed by an explanation of the Institute’s collaborative projects related to Southeast Asia, South Asia and cooperation to Bhutan by Dr. TOMODA, Head of the Conservation Design Section of the Japan Center for International Cooperation in Conservation, and another collaborative projects for restoring Japanese antiquities overseas by Dr. KATO, Head of the Resource and Systems Research Section of the Center. 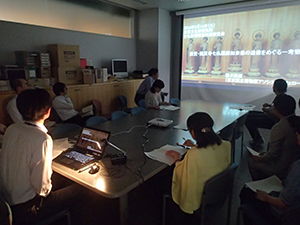 Dr. HAYAKAWA, Deputy Head of the Center for Conversation Science, described instruments for analyzing the materials of cultural assets while Senior Researcher Dr.MORII and Special Researcher Dr. KIDA explained how to conduct a survey into cultural assets of textiles or prevent patina deterioration of Japanese paintings. Her Royal Princess listened to the explanations by our staff members intently and the Institute believes that we played a small part of supporting restoring cultural assets in Bhutan. 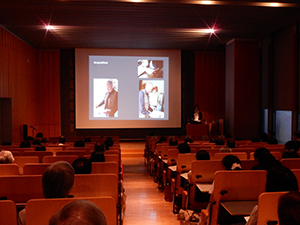 The exhibition hall –Seiki Kuroda’s atelier is reproduced and sketches of Talk on Ancient Romance and others are on display. The exhibition hall – From the section that reproduces the mural painting for the entrance of Tokyo Station for the Imperial Family, Wisdom, Impression and Sentiment is viewed. This year marks the 150th year since the birth of Western-style painter Seiki Kuroda (1866-1924) who made a great contribution to modernizing Japanese art and establishing the Institute. To commemorate this milestone, the Special Exhibition: Seiki Kuroda, Master of Modern Japanese Painting: The 150th Anniversary of His Birth was held at the Heiseikan, Tokyo National Museum from March 23rd through May 15th, 2016. The Institute, which has continued to conduct research and studies on Kuroda since its estublishment, was involved as an organizer in planning and composing the exhibition, resulting in making the exhibition that reflects the outcome of our research. In this exhibition, over 200 pieces of his works were collected together ranging from those he created while he was studying in France to those sent to Hakubakai that he led and those exhibited at Bunten, to sketches in his late life, not to mention familiar masterpieces such as Reading and Lakeside. 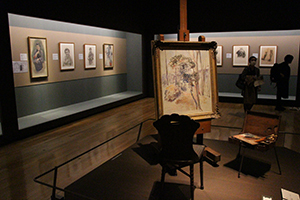 Moreover, as an attempt unique to this exhibition, paintings by French painters who influenced Kuroda while he was studying in France and those by Japanese Western-style painters with whom Kuroda got involved were also exhibited. As regards French paintings in particular, we invited Mr. Atsushi MIURA, an expert of French modern art and professor of the University of Tokyo, as a guest curator. French works, including Shepherdess with her flock (owned by Musee d’Orsay) by Jean-Francois Millet whom Kuroda looked up to and Froreal (owned by Musee d’Orsay, deposited in Musee des beaux-arts d’Arras) by Raphael Collin, his mentor, were also on display, providing a good opportunity to compare these with the counterparts by Japanese Western-style painters in order to identify what Kuroda learned from the mainstream of Western art and tried to bring over to Japan. 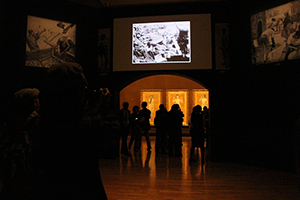 In the exhibition, while the audience appreciated Kuroda’s original works, real-size images of works that were destroyed by the fire during a war, including Morning Toilette and Talk on Ancient Romance, were also displayed. The mural painting for the entrance of Tokyo Station for the Imperial Family completed in 1914 based on Kuroda’s concept was burnt down in an air raid in 1945, but based on some photographs, a corner was set up to allow the audience to feel the ambience using images of Tokyo Station in those days as well. The exhibition not only coincided with the cherry blossom viewing season and Golden Week holidays but also received good reviews from various media; as a result, it drew as many as roughly 182 thousand visitors in total. With this exhibition, the Institute believes that Kuroda’s great presence was felt anew. The exhibition offered an opportunity to take a comprehensive view of his career as a painter and life on the one hand. On the other hand, there are still materials yet to be elucidated, including the letters addressed to him that the Institute owns. The Institute will continue to conduct research and studies on Kuroda and publicize the outcome on the Bijutsu Kenkyu (The Journal of Art Studies) and its website. These wooden statues at Keisokuji Temple that were featured in the presentation have been known as a rare example of existing statues of the type from early on, but it had scarcely been dealt with as a subject of a consideration. In the presentation, based on the knowledge gained form field investigations of each statues and the recognition that this set of statues are rare examples of the Tendai school, he supposed that the original wooden statues enshrined in Konpon Chudo of Enryaku-ji Temple in Mt. Hiei, while paying attention to the fact that they were statues with no gold leaf gilded. He went on to share his thoughts with the audience based on his recognition that it was a reproduction in the area. The presentation was followed by a question and answer session, in which seminar participants exchanged views and opinions actively with the presenter. The National Research Institute for Cultural Properties, Tokyo (NRICPT) held the first Canoe Summit at the 12th Festival of Pacific Arts in Guam on 26th of May, 2016. The summit was part of the “Networking Core Centers for International Cooperation in the Conservation of Cultural Heritage Project; Safeguarding of Cultural Heritage in the Island Countries of Oceania” scheme, which has been commissioned by the Agency for Cultural Affairs, Government of Japan. The Festival of Pacific Arts is held once every four years, and was attended this year by 27 Pacific countries and regions. The festival gathers artists, specialists on Pacific cultures, and community leaders. During the two weeks of the festival, a wide range of issues relating to Pacific culture were discussed and traditional dances and crafts were performed. 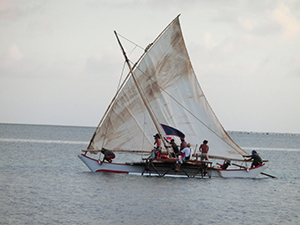 During the festival, NRICPT held the “Canoe Summit” in partnership with the Anthropological Institute of Nanzan University, the Traditional Arts Committee, Guam, and the Tatasi (Seafaring) subcommittee, Guam, with the support of UNESCO and the Organizing Committee of the 12th Festival of Pacific Arts, Guam. 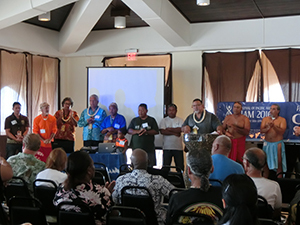 About 100 people attended the summit, and specialists and crews who are involved in activities aiming to preserve the cultures of Melanesia, Polynesia and Micronesia introduced their traditional navigation systems and discussed their cultural revival activities. The canoe is a symbol of Pacific culture and has important value as an aspect of intangible cultural heritage. It has recently been reevaluated as an important form of sustainable transport. However, a more pressing issue is how regional traditional cultures can be protected from the threat of globalization and natural disasters caused by global warming. Some attendees of the Summit felt that sharing information about the revival of canoe culture throughout the entire Pacific region was a very important contribution to ensure that the richness of Pacific culture will be passed on to the next generation. 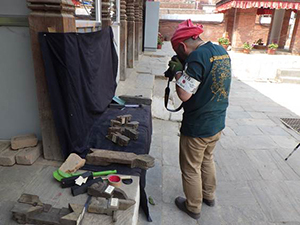 NRICPT has conducted a survey and assistance to protect the damaged cultural heritage by the Nepal Gorkha earthquake in 2015 since last fiscal year. 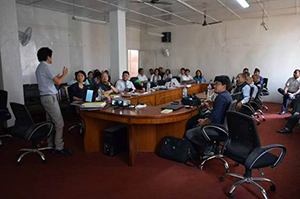 This year, NRICPT was entrusted by the Agency for Cultural Affairs to conduct the programme “Networking Core Centres for International Cooperation on Conservation of Cultural Heritage” (Technical assistance for the protection of the damaged cultural heritage in Nepal) and dispatched personnel to the sites from April 28 to May 8. In this mission, we handed printed reports on the survey result conducted last fiscal year to the director general of the Department of Archeology (DoA) and made a presentation at the DoA office to around 30 members of the technical staff in Nepal and the UNESCO Office in Kathmandu. The Participants showed high expectation of our future technical assistance through asking questions actively after the meeting. Meanwhile, as a main survey, we conducted survey on identification of the original location and numbering of salvaged members from Shiva Temple, which collapsed by the earthquake in Hanumandhoka palace in Kathmandu. In addition, we implemented photo documentation of each member. Through this research on the members, we revealed that the temple underwent restoration over three times at least. In Nepal where there is scarce record on the past restoration work, we expect the data gained from these members to serve as valuable information for the future reconstruction planning. We will continue to conduct surveys on the traditional building construction methods, structure, urban design and intangible cultural heritage with the participation of external experts from various fields. While carrying out these local activities with Nepalese people, we are hoping to be able to transfer a wide array of technologies to them.